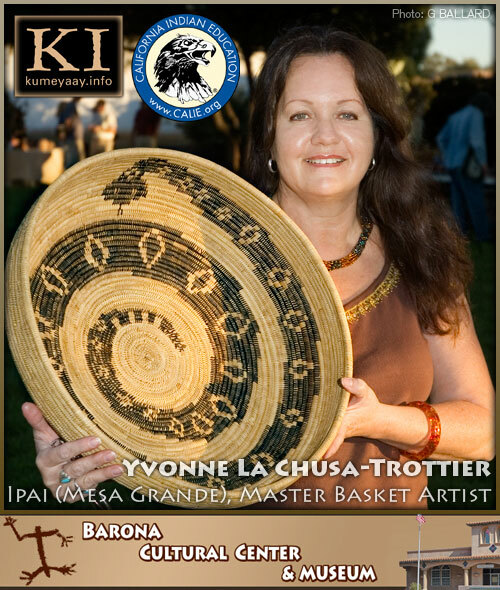 Yvonne La Chusa-Trottier (Ipai, Mesa Grande Reservation) returns to the Barona Cultural Center & Museum to teach another popular basket-weaving class. In this one-day Barona basketing weaving class, participants will learn how to make a traditional California Indian leaching basket. Leaching baskets are an instrumental tool used for hundreds of years in preparing the acorn to be made into shawii (acorn pudding). At Barona you will make a smaller version using the same material that the Kumeyaay ancestors used for thousands of years. Class is $20 and limited to 10 persons only. Ages 12 and up. Please RSVP at 619-443-7003 ext. 2 by October 9th. SPONSORED BY BARONA CULTURAL CENTER & MUSEUM on the Barona Indian Reservation.